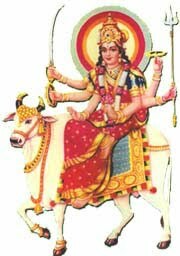 Goddess Umiya is an incarnation of Shakti and is the patron deity or Kuldevi of the Kadva Patidar community of Gujarat. She is referred as Shri Umiya Mata Ji or Shree Ma Umiya and is the almighty mother Goddess of the universe. She is the provider of strength, peace and prosperity. Goddess Umiya is the name given to Goddess Sati and Goddess Parvati by the Kadva Patidar community. Legend has it that once during one of their divine missions to annihilate demons, Shiva and Uma (Goddess Parvati) took rest on the banks of Saraswati River. Goddess Uma created 52 statues from the mud here and Lord Shiva breathed life into them. These 52 people became the first people of the Kadva Patidar Community. As per Kadva Patidar community tradition, Goddess Umiya has given birth to this universe and is the mother Goddess. Goddess Saraswati, Lakshmi and Kali are her incarnations only. She appears in different forms at different times on the earth to restore dharma and save her devotees. One of the most important temples dedicated to Goddess Umiya is located at Unjha in Gujarat.